Six-time NBA Champion. Six-time NBA Finals MVP. Five-time regular season MVP. Ten-time All-NBA First Team. Nine-time NBA All-Defensive First Team. Ten-time NBA scoring champion. Fourteen-time All-Star. These are the stellar career accomplishments of the NBA’s greatest player Michael Jordan. In 1989-90, Jordan won one of his 10 scoring titles averaging 33.6 points per game. Jordan was inducted into the Basketball Hall of Fame in 2009 and was named to the NBA's 50th Anniversary All-Time Team. In the rear neck is the Sand-Knit manufacturer’s tag size “46”. 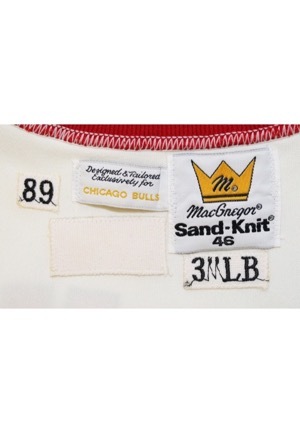 Adjacent to the left is the “Designed & Tailored Exclusively for CHICAGO BULLS” tag, a “89” year box tag and a blank strip tag. Adjacent below is a strip tag reading “3” LB” embroidered in black. On the right inseam is a flag tag with shirt materials and washing instructions. 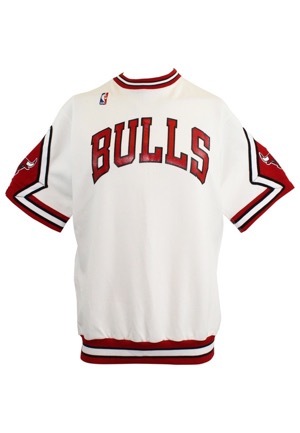 Across the front is “BULLS” painted on in red block letters with a black border. On back is the player number “23” done in heat transferred red vinyl with black borders. 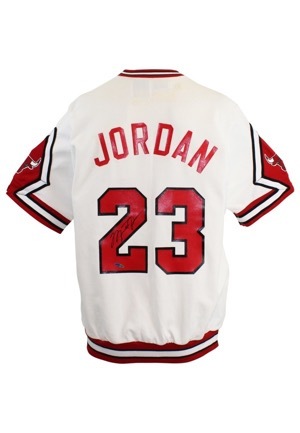 The player name “JORDAN” appears on back in heat transferred red vinyl block letters. 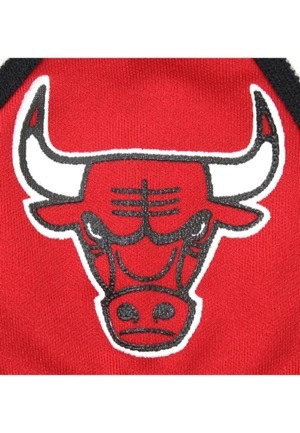 On both sleeves is the team “Bull Head” logo. On the upper right chest is the official “NBA” logo embroidered. 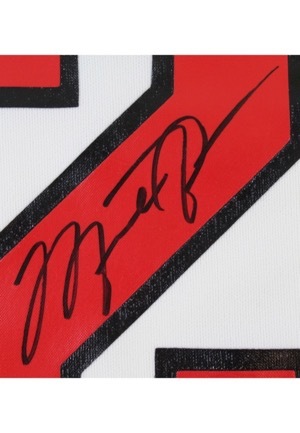 Jordan signed on the back inside the player number “2” and in our opinion the signature rates a 10. Adjacent below the autograph is an Upper Deck hologram serial number “UAS07560”. This warm-up jacket is properly tagged, was presented to us as player-worn and in our opinion shows wear.